I threw this together with a couple of 2x2's, mounting lag screws, wing nuts, lock pins, 150' of 3/8" Manilla Rope, cut-up/drilled 1x2's as rope binders, pup tent wooden tent pegs and 10'x12' 10 oz. tarp. Total price was under $80. I was thinking about picking up a 8'x10' tarp, cutting it up, doing a little stitching and making some walls to simulate a small wall tent. Location: Austin, TX - U.S.A.
Get a grommet kit and add a few more lines to the long edges. With 4-5 lines per side you will be able to get rid of the two stabilizing lines you have to the uprights and eliminate a trip hazard as well as enhance the authenticity of your fly. As to the sides, that is a great idea. I considered doing just this very thing before I was able to secure my small wall tents. I took two 9x12's and seamed them together along the 9 foot edge and now have a very nice sized fly I can use with various height uprights and create more or less "walls". something you may want to consider prior to sewing on those walls! Currently I am running the fly without a ridgepole. With the addition of the extra side lines (there are grommets already there), will the vert's hold upright without the stabilizing lines? Or, do I just need to throw together a lightweight ridgepole? 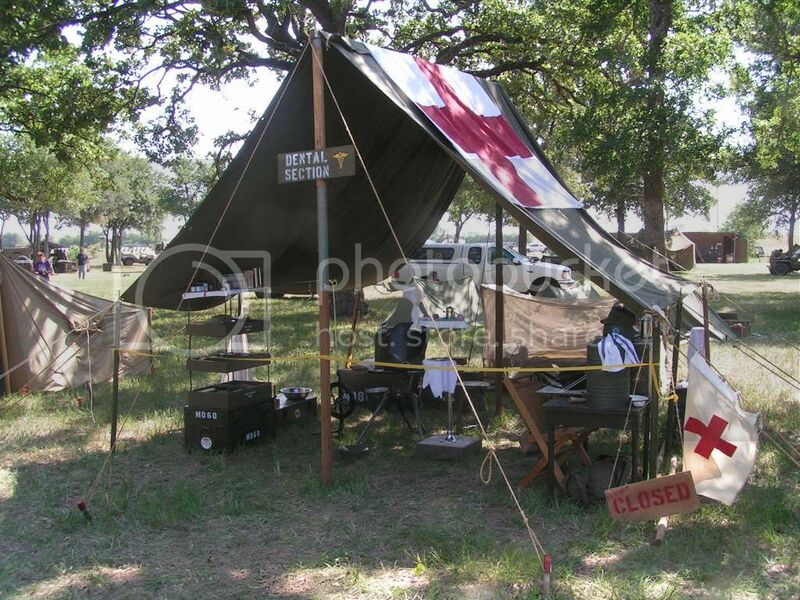 I recently helped identify a source for a Large Wall Tent from a reputable tent maker in the East-Central US - WWII Impressions is asking $2850 ea - this guy wants about $1125 with no fly - add $400 for the rain fly. No posts, poles or ropes. Interested - drop me an e-mail for details. Last edited by TenthA86 on Sun Dec 30, 2007 17:24, edited 1 time in total. Is this a reproduction, or is it an original? The problem will be the shipping fees to the United Kingdom for me, which I suspect will be rather expensive. Good point for clarification, Ben. This is a newly made reproduction, made in the USA, and shipping is extra. I've always wanted one for an Aid Station, and this is about 1/2 price of what has been available here.